Genius Hour: Day 1 - "The Before Shot"
The beginning of each new year brings with it a lot of the same old traditions. Everyone is setting new goals, and declaring new resolutions to better themselves -- one of the most common, is getting into shape. It seems like almost every other radio commercial is offering special deals on gym memberships and every other ad on social media features "before and after" pictures of some miraculous weight loss success. The trick, is sticking to the resolution. As we kicked off our first working day for "Genius Hour" (which some kids have elected to call the "Power Hour" which I kinda like), I told the students that today was a big day. Today is their "Before" picture. I reiterated that they will spend the last 10 minutes of class documenting their progress, and as they write their journal, or record their vlog today they should describe their starting point; where they are now, so that we can compare that to the dramatic progress they will (hopefully) make over the course of the next 9 weeks. I stressed again the importance of documentation and telling their story so that the full effect of the next 9 weeks could be fully understood and appreciated. Documenting their progress is also the largest part of their grade for Genius Hour, but I would prefer they focus on the "why" rather than the "grade". There were several highlights to the day, the most consistent of which was student focus. Are you ready for the first huge revelation? Apparently -- get this -- the vast majority of students will remain engaged and focused on their work if they're allowed to work on what they want to. Sure, there was some discussion going on in class, but 85-90% of it stayed on topic with what the students were researching or studying. For the most part, everyone stayed on task as they researched new languages, watched YouTube videos about sign language, and learned about sewing, cooking, and a wide variety of other topics. One student even taught me how to sign, "I know a little sign." A big "win", was making sure all our students with projects labeled as "yellow" or "red" from last week had a "green" direction today. I'm happy to say that by the end of class, everyone had an approved plan. We had a handful of students that expressed an interest in teaching. I thought what better way to show them what it's like to be a teacher than to -- let them assist another teacher. So I arranged to have these students serve as a teachers assistant to Mr. Cahill's 5th grade social studies class. They monitored students and helped pass out papers. Several students had to reach outside the walls of our school to follow their Genius Hour project. One student, who wants to create a ceremonial baseball bat for the team, had to find access to a large lathe. Through a friend-of-a-friend-of-a-teacher, he believes he's found one and hopes to possibly relocate it to the Forge (our super maker-space) by next week. There are a number of students that want to learn about cooking, including one that wants to make his own cheese. These students are able to research and take class polls during Genius Hour, but their actual activity will take place in the kitchen at home. They know this....and they're totally "ok" with it. And then there were students that simply wouldn't leave. These two, pictured below, were in the class before lunch. After I dismissed everyone and the room cleared out, I glanced to my right and there they were, still working away. 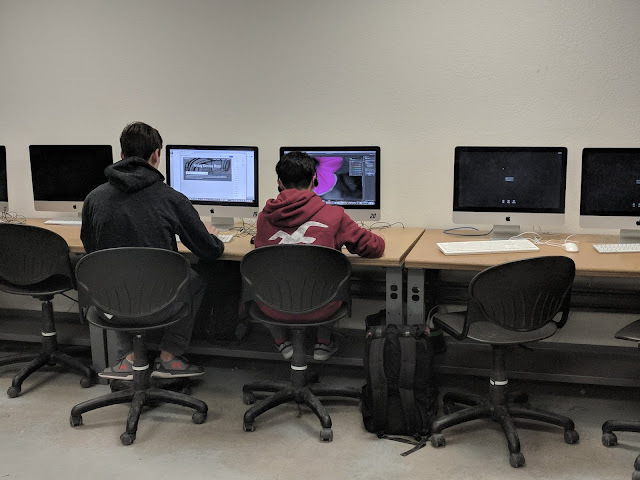 One student was searching for 3d models so he could learn how to print on the 3d printer, while the other was learning new techniques for retouching and enhancing images in Adobe Photoshop. "Mr. T, can we just stay in here during lunch and keep working on this?" What was I going to say -- "No?" Not only did they finish up what they were working on, they also got the opportunity to set up our new 3d printer. Even though overall things went extremely well, I still think there are some minor tweeks to make things more effective. There was a little confusion about how they could journal. It appears in last week's introduction that I didn't stress enough the importance of sharing their learning with the world. Several students were trying to simply document their learning in a Google doc that they planned to share with me. That doesn't quite qualify as sharing their experience with the world. As of next week, I'll create an assignment in our Google Classroom to share a link with me to either a website, their S.H.I.E.L.D. (portfolio) site, or a YouTube channel. Looking back, I'm pretty sure I missed the boat on this one and should have does this beginning with week one. I sent out my request to teachers the night before our Genius Hour (bad Todd) which didn't give them much time to reply. As a result, only one teacher welcomed the opportunity. I've since had another teacher say she was totally in, and would love the help. Hopefully, I'll have at least one or two more takers before next Friday. Ultimately, through the minor chatter, the students were engaged, researching and learning. I admit, there were a few times when I spotted a cluster of students circled up and laughing when I felt that urge to break it up and say, "Shouldn't you guys be working on your project?" But I held back and instead did a quick flyby to find that, they were indeed discussing or gathering information for their project. They were simply having fun while doing it. So, for at least one hour a week, I've got classes of students creating and engaged in their own learning, problem solving, and having fun while doing it. But, to be fair, we're just at the beginning of this adventure where everything is new and exciting. The real question is, can we maintain this level of interest and engagement through the remaining 8 weeks, or will the dedication fade like last years resolutions? Genius Hour: Day 2 - "Show Me"